Steel making by the electric arc furnace (EAF) has very good flexibility with respect to the selection of charge materials. The traditional charge material for the EAF process has been 100 percent cold scrap but as the issues regarding scrap such as its availability and quality, market price fluctuations and restrictions imposed by scrap in making some steel grades due to residual elements and nitrogen level etc. have increased, EAF operators intensified the search for alternative iron materials. Direct reduced iron (DRI), hot briquetted iron (HBI), pig iron (PI) and hot metal (HM) are the alternative iron materials which have been used in varying percentage successfully by EAF operators. The use of hot metal is more popular in those areas where there is shortage of scrap and/or electric power. The source of hot metal is blast furnace hence hot metal can be used in those EAFs which are in close proximity of the blast furnace, otherwise the EAF operator has to use pig iron. Pig iron will need extra energy for its melting. Presently EAF can be designed for using up to 80 percent of hot metal in the charge. In recent times the main emphasis in EAF steel making has been related to achieving maximum energy efficiency. Further the feed charge materials are influencing the design of the EAFs and their operation practices. The influence of HM as a charge material on various key parameters of an EAF process of steel making is detailed below. Residual elements – Residual elements also known as tramp elements cannot be removed from the steel during processing. Therefore, the amount of these elements in the product is a direct function of the amount of these elements charged to the steel making process through charge materials. High levels of residual elements can affect casting and rolling operations besides affecting the product quality. By adding HM, which is a clean iron unit, in the charge mix the level of residual elements in the liquid steel can be reduced to acceptable levels through dilution. Nitrogen level in steel – Nitrogen is generally considered as undesirable impurity which causes embrittlement in steels and affects strain aging. Nitrogen in the liquid steel is present in the form of solution. During the solidification of steel in continuous casting, nitrogen is the main reason for the formation of blow holes. Hot metal because of its lower nitrogen levels, provides a dilution effect and also results into generation of carbon mono oxide (CO) gas within the steel bath through C boil which further leads to lowering of the nitrogen content in the steel. Removal of hydrogen – CO gas evolved during the decarburization process helps in the removal of hydrogen. It has been demonstrated that decarburization at a rate of 1 % per hour can lower hydrogen levels in the steel from 8 ppm to 2 ppm in 10 minutes. Influence on productivity and other operating parameters – With the use of HM in the charge mix there is larger oxygen consumption which helps in improvement in productivity of EAF, in shorter tap to tap time, improved Fe yield and reduction in specific power consumption. With the use of HM in the charge mix, the saving is in the range of 4-8 kWh / % HM in the charge. 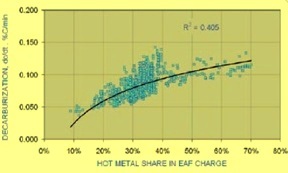 Fig 1 shows relationship of productivity and specific power consumption with percentage of hot metal in the EAF charge. Role of carbon – During steel making in EAF, carbon is needed in order to react with the oxygen and iron oxide to help in slag foaming. Some carbon is also needed for meeting of the product requirement. Carbon is also charged in the EAF to react with in the bath with injected oxygen to produce CO gas as well as to give sufficient chemical energy input for saving consumption of electrical energy. The generation of CO gas within the bath helps in achieving low concentration of dissolved gases in steel. The CO gas bubbles also helps in slag foaming (create an emulsion) which helps to contain the electric arc and improve energy transfer to the steel bath instead of to the furnace shell and transfer to the bath by radiation (energy transfer efficiencies under various slag conditions are given in (Tab 1) . It can be seen that totally immersing the electric arc in the foaming slag will have huge positive effect on the energy transfer. Thus heat losses through radiations can be reduced. The total amount of carbon needed in operation of EAF depends on several factors namely (i) carbon content of feed materials (ii) planned level of oxygen consumption (iii) desired tap carbon level (iv) Economics of Fe yield vs. carbon cost and (v) capacity of exhaust gas system. Carbon is usually added in the EAF in the form of coal or coke which has got an ash content which is an unwanted material in steel making. HM has C in the range of 3.8 % to 4.5 %. Hence use of HM saves a lot of cost when compared with the addition of carbon to the bath from external sources. Fig 2 Decarburization rate and hot metal share in EAF charge. Comparison with carbon content of DRI and/or HBI – Further in case of DRI/HBI (EAF feed material) carbon is also needed to reduce iron oxide present in the DRI and /or HBI. This increases the requirement of charge carbon. In case of HM such requirement does not exist since HM is having 100 % metallization. Silicon and manganese content of HM – HM contains substantial quantity of silicon and manganese. These elements when they get oxidized provide chemical energy which further reduces consumption of electrical energy. However these oxides being acidic in nature increases consumption of flux (CaO and MgO) to keep the level of slag basicity. In order to utilize the advantage of hot metal temperature, its charging into the furnace should be done with a closed roof. Usually steel melting shop logistics and layout limitations along with positioning of the various EAF equipment limits the available space where a hot metal runner can be inserted into the furnace shell for charging of the hot metal. 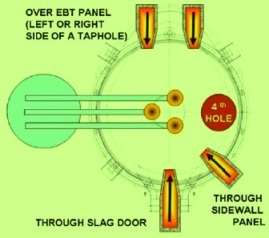 Typical locations of hot metal charging in an EAF are shown in Fig 3. Further charging of hot metal in an EAF needs extra care since contact with highly oxidized furnace slag or cold scrap can result in violent reactions. Loss of control during hot metal charging can result in overflowing of slag and metal from the EAF. The following points are important during hot metal charging in an EAF. Hot metal ladle tilting control should be precise enough to ensure stable pouring rates. The runner should be preheated between the pouring operations.